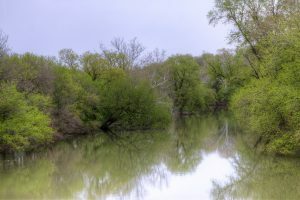 Conococheague Creek has many pronunciations – though it seems the most accepted is “KAH-no-KAH-cheek,” with the accent on the second to last syllable. Conococheague Creek begins in Franklin County, Pennsylvania, and flows into Maryland. It crosses under the old C&O Canal aqueduct near Williamsport, Maryland, and then into the Potomac River near Chambersburg. Williamport sprang up at the juncture of the Conococheague and the Potomac, when Indians hunted in the area, and settlers crossing into the Shenandoah Valley needed a trading place for goods and grain for farmers.